I had the opportunity to look through old pictures with my husbands aunt yesterday. The photos were of my husbands grandfather who passed away this past May. He was 94 and when he was a young man he served in World War II. In this album were many amazing pictures of him from the war, along with letters he had both received and written. Grandpa didn't talk about the war with anyone. He believed it was something that shouldn't be celebrated because it was a very horrible event. I learned that he didn't even like the Fourth of July because of this reason. 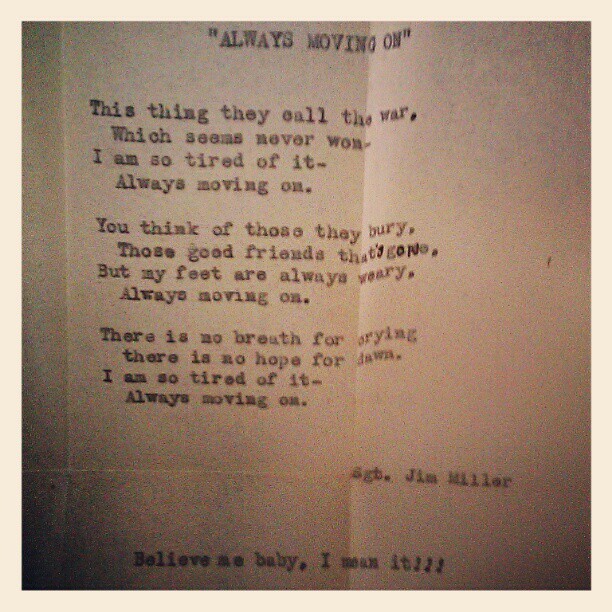 This picture I am posting is a photo that I took of a poem he wrote in the war. It is typed out on this very thing and aged piece of paper. I hope to get a proper scan of the letter soon. Believe me baby, I mean it!! !